In this post we want to cover two often confusing transactions you will see in your Amazon settlement files that A2X imports. The first is the Current Reserve Amount and the second is the Previous Reserve Amount Balance. Firstly, a bit of background to these transactions. Why does Amazon withhold payment? Sometimes Amazon withholds some or all of your settlement payment for various reasons. 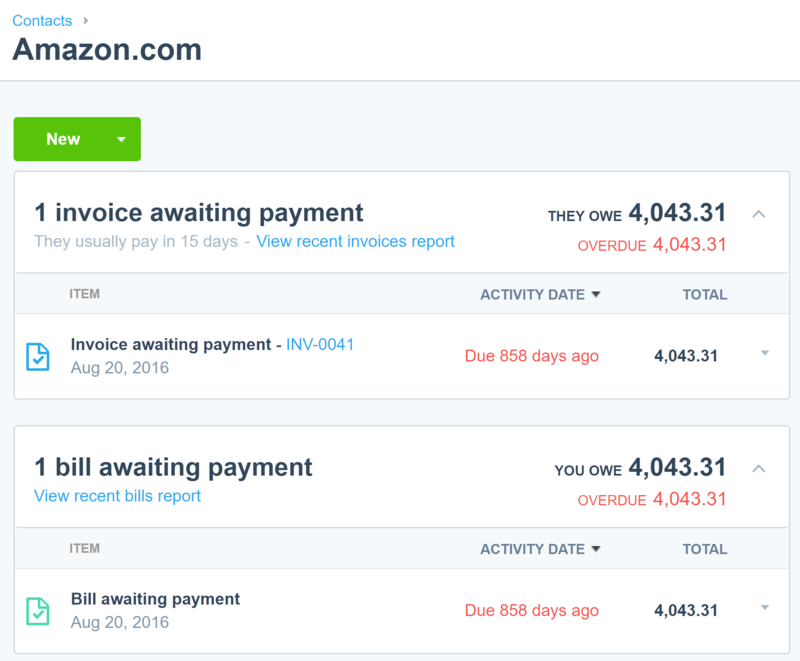 Some examples of why we have seen Amazon do this to sellers: you're a new seller with no history, your credit card on file with Amazon is expired, or there's a bank account validation problem in your seller account. You'd not be the first seller to feel hard done by when Amazon withholds a large settlement because your credit card expired! When this happens your settlement amount will be reduced, sometimes to zero. This can cause two possible scenarios when posting the data from A2X. 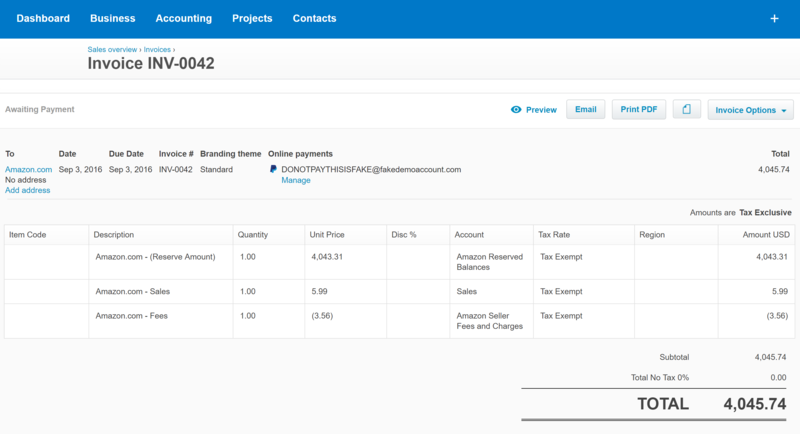 In this post we wanted to cover the two scenarios, and how we suggest accounting for them, and treating them in Xero. Scenario A) you have a 0 balance settlement in a single month and scenario B) you have a 0 balance settlement that spans two months. In this scenario you have one $0 invoice as all the transactions relate to one month - in this case there’s no action required in Xero. A $0 invoice does not need to be paid, it just records the transactions which cancel each other out. The Current Reserve Amount should be allocated to either a suspense account or the Amazon Reserved Balances Asset account in Xero (we will use the suspense account throughout our example but if you are using our default mapping this will be allocated to the Amazon Reserved Balances Asset account) so that when Amazon releases the reserved amount to you (Previous Reserve Amount Balance which you also code to the suspense account (or the Amazon Reserved Balances Asset account in Xero) there will be both a Debit & a Credit in the suspense account which will in effect cancel each other out. After this, in the next period you'd expect a corresponding invoice with a Previous Reserve Amount Balance added in to it, which you code to suspense too. We have provided a very basic example scenario below and a way in which we recommend accounting for this. Please note: these are demonstration invoices with greatly simplified transactions to make the example clear. 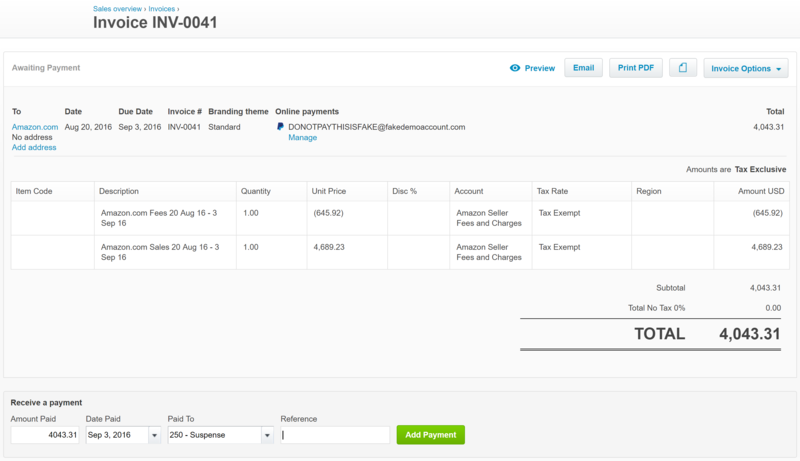 In this example you have an Invoice and a Bill created in Xero (by A2X) due to the $0 net Amazon Settlement. 1. Invoice for $4043.31 gets allocated to normal sales/expense accounts as usual. 2. The reserve amount on the Bill of ($4043.31) gets allocated to the Amazon Reserved Balances asset account. It's also worth noting that sometimes there will be other transactions on the second invoice period for the Bill. The other scenario you may see is the situation where Amazon withholds some, but not all of your settlement, in which case the Reserve amount will not completely zero out the settlement, and will b paid forward into the next settlement. 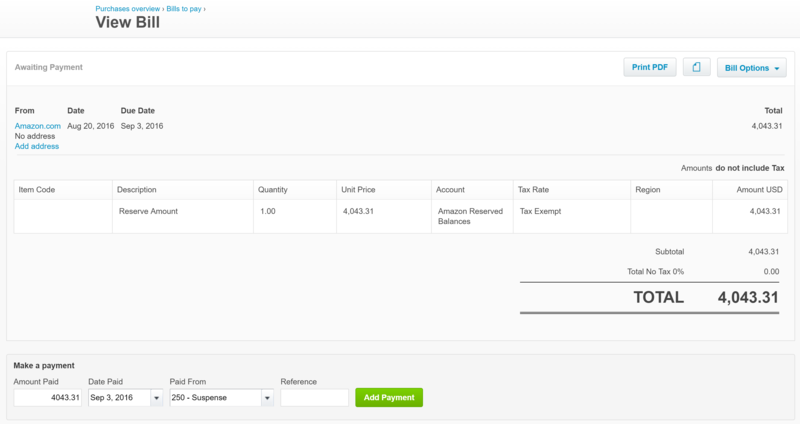 The invoice and bill in Xero need to be offset against each other so that you don’t have a payable and receivable amount sitting in Xero unreconciled. There are numerous ways this can be achieved in Xero however our recommendation would be to enter manual payments against both the Bill and the Invoice in Xero but instead of using a bank account that you would normally make/receive payments from, you use a Suspense account so the two payments cancel each other out. An example of this is provided below. Note: The settlement above contains other sales/fees on top of the ‘Reserved’ amount – this is ok, it is only the reserve amount we need to allocate to the reserve account. The above step cancels the amount out of suspense. This is our general advice on how to handle the two different scenarios where Amazon reserves some (or all) of your settlement payment. The key is to use the suspense and or Amazon reserve balances account as a temporary holding account which will eventually net out to zero. The other trick is to use the payments to and from the suspense account to mark invoices and bills as paid, if they reflect zero balance settlement periods (as there is no bank transaction to reconcile against in Xero).